The numbers tell one story, but what's behind them might be something entirely different. For the first time since the CMS started releasing inpatient claims and payment data, sepsis topped the list as the most common condition or procedure. The condition cost Medicare more than $6 billion in 2015, according to a Modern Healthcare analysis of CMS data. Joint replacements were second on the list. But patient safety experts say the rise in sepsis discharges doesn't mean the condition has suddenly gotten worse. Rather, sepsis is now diagnosed sooner by clinicians so they can treat the infection before it develops into severe sepsis and becomes life-threatening. "If we find early, we can treat it when it's reversible. What has come from all of this is we are diagnosing it sooner," said Dr. David Gaieski, a professor of emergency medicine at Thomas Jefferson University. 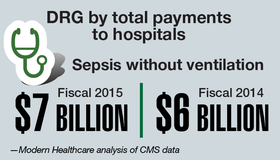 Another driving force for the high sepsis discharge numbers in 2015 could be because the CMS Sepsis Core Measure went into effect that same year. The measure defines sepsis and requires providers to follow a multistep treatment plan in order to be reimbursed. Download the PDF.